ST. GEORGE — Dixie State University will begin construction on its new Human Performance Center with a groundbreaking ceremony and open house Oct. 25. The ceremony will take place at noon at the Human Performance Center build site, which recently has served as the Student Activities Center parking lot. Immediately following the groundbreaking, the open house will provide opportunity to the community to see renderings, ask questions and learn more about the state-of-the-art allied health facility. 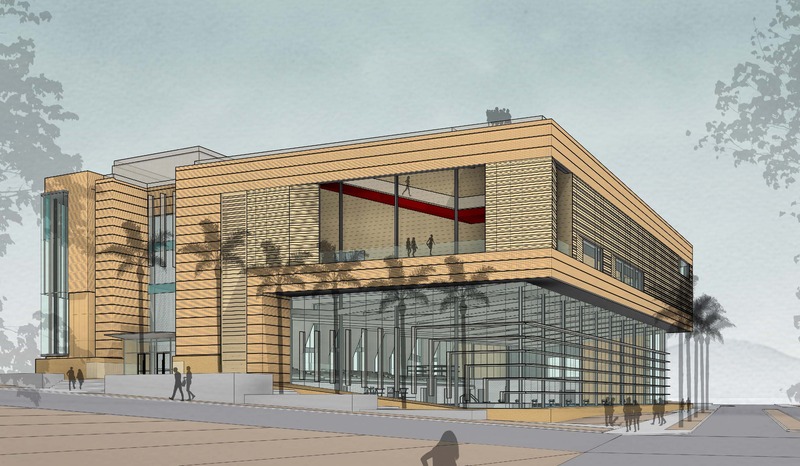 Dixie State is working with Layton Construction, MHTN Architects and Hastings+Chivetta design services on the 155,000-square-foot facility, which is expected to be ready for the fall 2019 semester. The $55 million project is funded by appropriations from the Utah Legislature, student fees, and donations from Washington County, the city of St. George and private contributors. The facility will hold the specialized classrooms and labs the university needs to offer Health and Human Performance programs such as recreation and sport management, population health and exercise science. The center will also provide the space necessary to partner with the University of Utah to offer physical and occupational therapy programs in Southern Utah. In addition to housing Dixie State’s campus recreation and intramural programs, the building will include exercise facilities such as basketball courts that convert to indoor soccer venues, a student fitness center, a climbing wall and an indoor track that connects to an open-air rooftop, one via a suspended sprint track. The roof will provide space where the university can host special events outside as well. The center will feature a 50-meter Olympic-size swimming pool with deck and spectator space, making it the only pool in Southern Utah to meet NCAA requirements to host Division II meets and the second in the state to do so. The Human Performance Center will cater to the needs of Southern Utah’s event-based tourism industry. The facility will be equipped to host local, regional and state high school swim meets, Huntsman World Senior Games competitions and community-sponsored sporting events. Preceding the groundbreaking ceremony, the DSU Health and Counseling Center will host its “Active Learning Active Life Wellness Fair,” designed to showcase services that support mental and physical health throughout Washington County. The fair runs from 8:30 a.m.-2 p.m. Oct. 25 on the DSU Diagonal. What: Groundbreaking ceremony and open house for Dixie State University’s Human Performance Center. When: Wednesday, Oct. 25, noon. Where: Build site (most recently the Student Activities Center parking lot). When: Wednesday, Oct. 25, 8:30 a.m.-2 p.m. While this building may be a good addition to the campus, the choice of contractor is questionable. Layton keeps getting all of the big projects in the area while many other fully capable large scale general contractors are left out of the loop. How much is the reward for your return?